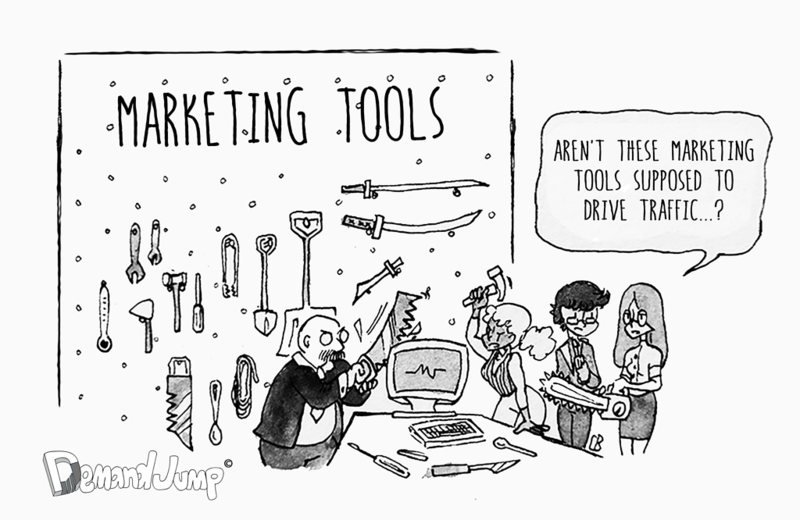 There are literally thousands of marketing tools available today. Each one is designed to help a marketer execute, automate, or track something. From Automation tools to A/B testing software to analytics solutions there are dozens of solutions for any one of the many actions marketers must take to improve traffic, engagement, revenue, and reach. The truth is, these tools are not specifically designed to help understand exactly what actions a marketer must take to yield the most qualified traffic to your site, and ultimately grow revenue. Sure, they are fantastic options, and often necessary pieces of a productive marketing stack. But none of them tell you where untapped traffic opportunities are hidden, what those actions are likely to yield in terms of revenue, what influencers are the most powerful for each specific topic or set of topics, and the list goes on. Why? Because marketing funnels are a false view of reality. Marketing more closely resembles a multi-dimensional spider web (aka the Internet) that is extremely complex, interconnected and is always changing from moment to moment - much like the human brain. To solve this an Artificial Intelligence Marketing (AIM) Platform is required to unwind the best opportunities that we as humans cannot see. Most of us would believe that hundreds of sites impact our business. When in the real world, it is literally tens of thousands. AIM provides marketers with specific insights and recommendations to uncover the best sources for revenue growth, outmaneuver your competition, and stay ahead of the constantly changing market. Think of it as “Artificial Intelligence meets Actionable Intelligence” - AI Meets AI. For more information on DemandJump, follow this link.